Please call Peter at 910-262-3218. Boat Location: Hampstead, North Carolina. This fine Duffy 35 was refit at the Al Pettigrew Yard in SW Harbor Maine in 2016. All new paint, new interior soft goods. New Furuno wireless radar and 1000′ color depth sounder. Solar panels on cabin top. All new stainless steel port lights and new batteries. Just bottom painted, new zincs, prop coat and surveyed. Forepeak, hanging locker, head, galley and salon lockers were all repainted with epoxy July 2017. Drapes dry cleaned, window frames and door frame painted and walls just cleaned 8/2017. This classic design is built Maine tough for simplicity, comfort, and low maintenance. Great boat for a couple to cruise the great loop, explore, and live abroad simply. No brightwork to slave over and commercial systems strong. Generator and air conditioning give her year round comfort. HISTORY- DORO was designed by Spencer Lincoln and built in Maine by Atlantic Boat Company in 2001. The owner of Wellington Yachts of Jacksonville, Florida finished her interior custom as his own yacht in 2002 for his retirement cruising. 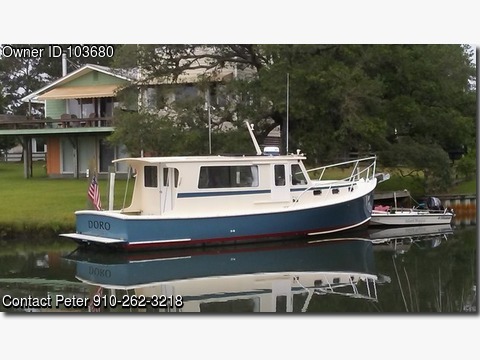 Her bottom is 3/4″ solid fiberglass laminate wit a 1/2″ solid transom. Her deck is balsa cored laminate over an 1″ thick. Her deck house is fiberglass. She burns around 2 GPH @ 8 knots and 8 GPH @ 16 knots and 1700 rpm. ACCOMMODATIONS- First forward is the chain locker. Next aft is a large double V berth. There is a hanging locker to starboard aft of the V berth and forward of the head. The head is a “wet” type diverter shower. There is a 12 volt Raritan macerator type toilet. The galley is to port with a two burner propane range and refrigerator. There is a stainless steel sink. The galley and below deck area are trimmed in Cherry with a satin finish and have Teak and Holly and Rosewood soles. Up and aft is the main salon/pilothouse. There is a dinette to port and a bench settee to starboard. Each bench settee could accommodate 1 adult for sleeping. The control station is to starboard forward. The engine compartment is underneath accessed via ample hatches. Centerline door open aft to the open partially covered aft cockpit. There is a sliding side door to the starboard deck. The interior is light and airy, clean, and simple with Cherry wood trim and Brazillian Rosewood soles. GALLEY- Princess propane stove with safety solenoid valve, 110 volt GE refrigerator, Stainless steel sink, Hot and cold fresh water pressure system, Storage. ELECTRONICS- Furuno 1000′ Colorscope (2016), Furuno wireless radar (2016), Garmin GPS 152 -inop, Standard Horizon VHF, Garmin GPS Map 182C, Raytheon autopilot. ELECTRICAL- Next Generation 5.5 Kw generator – oil serviced 5/2017, Generator starting battery (2016), 12 volt lighting, 2 x 30 amp 120 volt shore power connections with cords, 2 x 8D 12 volt lead acid batteries (2016), Heart 2500 Watt inverter/charger, Xantrex battery monitor, 110 volt lighting, AC and DC voltmeters on main electric panel, Raritan 12 volt macerator toilet. DECK-Simpson Lawrence 12 volt windlass, Delta anchor, Swim platform with SS drop down ladder, Custom aluminum bow rail, Windshield wipers(2), Chain/rope rode with G4 chain, 12 volt horn, Hinged signal mast with lights, 7 oversized mooring cleats, Mesh window covers, 4 flush rod holders, Strategic hand rails, Freeman commercial grade aluminum aft deck watertight hatch, Solar panels flush mount (2016),(6) new stainless steel portlights w/ screen (2016). MECHANICAL- John Deere commercial grade 330 Hp Powertech 8.1 liter engine 1175 hrs, oil serviced 5/2017 @ 1150 hrs.Sleipner Side Power bow thruster, Single lever control, John Deere instrument panel, Bennett trim tabs, 3 automatic bilge pumps, Dripless type shaft seal, Electric toilet with macerator, Holding tamp with Sea Land type pump, Shower sump with 12 volt pump, Twin Polar Bay 12,000 BTU reverse cycle air-conditioning, Fireboy automatic discharging fire extinguishing system for engine compartment with status indicator at helm, Bronze thru hulls and seacocks, Commercial grade power hydraulic steering, Twin Disc MG6000 series reduction and reverse gear, Racor filters engine & generator(2016).